This past weekend brought a day of perfect Autumnal sunshine on Sunday. It was such a change from the wet and windy weather we’ve been having that I was out of the house like a shot clutching my camera and wandering the lanes. 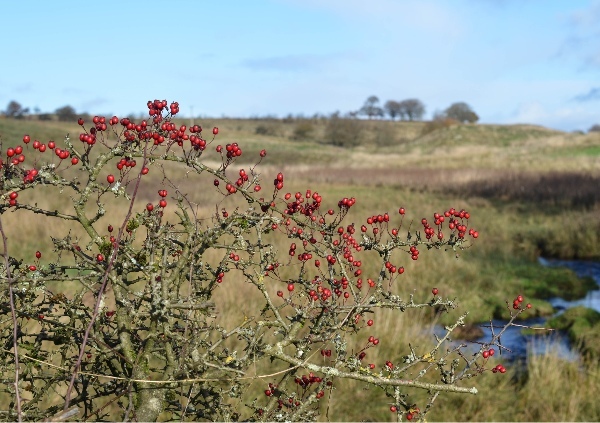 The golds of Autumn were everywhere, but what kept catching my eye were the cheery red Hawthorn berries dotting the hedgerow like little rubies glinting in the sun. Haws aren’t the sort of berry you can graze on as you walk the lanes. You’d rather choke on their rock hard innards and bitter taste. However gather these little gems and take them home for cooking and you have a treat in store. Needless to say I had left the house unarmed with any sort of bag for collecting. I couldn’t miss this chance to make the most of the bounty so made use of the pouch pocket in the front of my less than glamorous sweatshirt. I plucked and picked my way along the lanes and headed home with an outline not unlike that of a mothering kangaroo. On emptying my pouch I found I had 500g of haw berry goodness. Now what could I do with them? I immediately thought of chutney but dismissed this one as I’d used up all the dried fruit the other day and hadn’t replaced it yet. How about just almost making chutney and having it as a Hawthorn Berry Sauce instead. A spicy sauce, something deep and fruity and rich – a bit like HP sauce in fact. For non UK residents HP sauce is a spicey and fruity brown sauce, a bit like a chutney ketchup really. I was determined right there and then to try to make my own version of HP sauce using hawthorn berries as my base. Come on, doesn’t everyone do this on a Sunday afternoon? It was a case of boiling up 300ml cider vinegar and the same amount of water with my haws until they were tender, this took me about 35 minutes. Then I pressed them through my trusty old Muolie grinder (a sieve and wooden spoon would do but I do like playing with my old kitchen toys now and then) and returned the pulp to the pan and added in 175g of light brown sugar and the following spices; 1/2 teaspoon each of salt, ground ginger and grated nutmeg. Also a pinch each of ground cloves, ground allspice berries and black pepper. I brought it slowly back to the boil letting the sugar dissolve completely first and then boiled for about 5 minutes. This just made enough for one 350ml bottle of ketchup but boy was it worth it. I love to have HP sauce on a bacon roll or with corned beef or meatloaf. Yesterday (a bit of a grim day for me really) called for a major cheer up so I treated myself to a fabulous tartine topped with salad and corned beef and of course my HB (hawthorn berry) Sauce. Amazing! Hawthorn berry sauce is spicy, fruity and fabulous, just like good old HP sauce. So if you are out a wandering in the countryside try this with those haw berries you can so easily pop in your pockets. 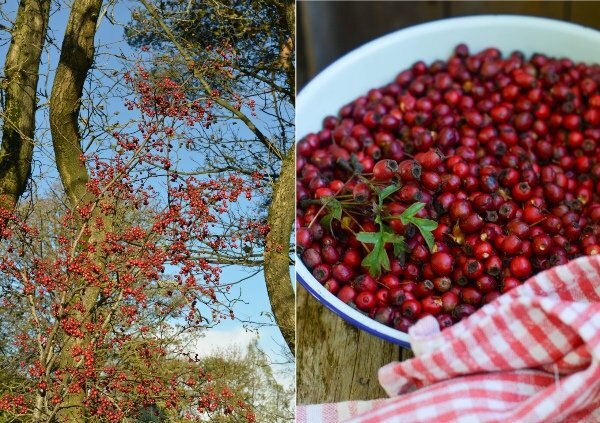 Cook the hawthorn berries in the vinegar and water at a simmer for approx 35 minutes until tender. Press through a sieve with wooden spoon or use a veggie grinder. Return the pulp to the pan and add all other ingredients. Warm to dissolve sugar and then boil for 5 minutes. Pour into a sterilised bottle. 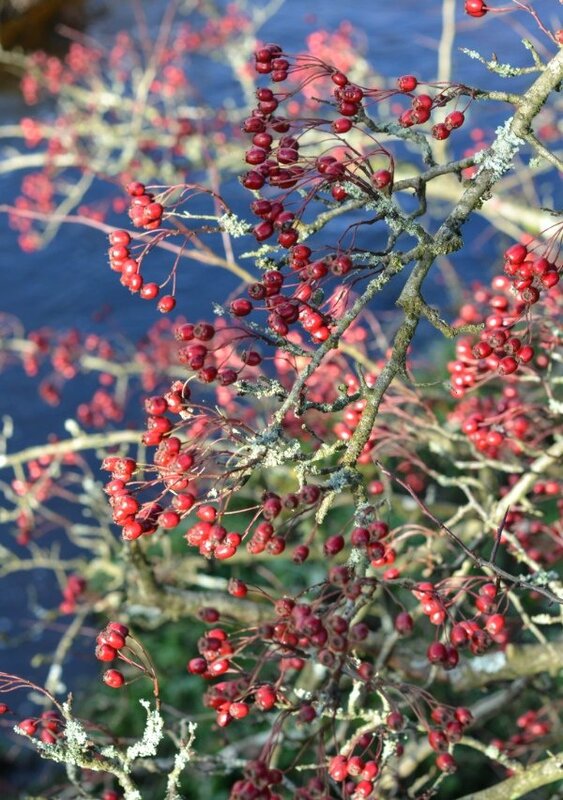 First time I’ve seen a use for haws, there’s an awful lot of them this year here, hedgerows are red with them. If you have these wee beauties arouond you then go on and make this ketchup, it’s SO good! I don’t think we have any of them around here! Sounds very good…but please explain, what is HP sauce?!? Did you “chat” with Idgy yet? Get on it girl!! Oops didn’t realilse you guys didn’t have this fab sauce in USA. It is a rich brown sauce packed with fruit and spice taste, savoury and wonderful! Spoke to Idgy last night and cleared the air. Wow, that looks amazing. I am super impressed. I must look our for them on walks now! You must have these around your area, no excuses now, get saucy! Wow – what a great use for these berries. I have to confess that I am not a huge HP sauce fan but my husband LOVES the stuff so he would definitely appreciate this recipe. Pleased to have discovered your blog via tinned tomatoes! 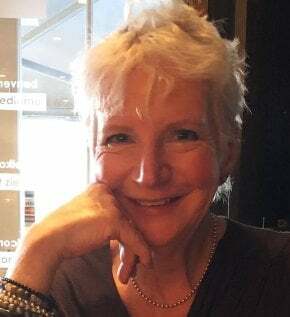 Hi Antonia great to hear from you. Why not make a bottle for hubby’s Christmas stocking? Glad you like the blog and thanks for stopping by. I’m wondering the exact name of this bush or tree. I am in Canada and we have a Hawthorn tree here. Would they be the same? yes hawthorn tree is one and the same thing. I also think I have lots a these trees around my place in canada but we alwased called them choke cerries. I think they are the same, just a kids version of the name? Choke cherries are not the same as hawthorn berries which are smaller and bright red when ripe. I’ve used choke cherries before and they do give a good flavour so this may well be worth a try. Let me know how you get on. Any substitutes for hawthorns ? Not too many hedgerows here in oz. my wife just came England but she only brought me back one bottle of hp fruity . Some people just don’t get it . We can get the normal hp . Try using plums, they will be sweeter though. So glad you like this recipe, it is one of my favourites as we’re surrounded by hawthorn bushes up here. Just read your post , I thought hawthorn seeds were toxic, so grinding the berries would also grind the seeds? thank you so much for the recipe, the source is delicious! amazing depth of flavour, love it! We don’t have hawthorns where I live in Turkey. Could I use Cranberries instead. Just made your plum and chilli chutney. It’s brill. You would get a completely different far sweeter taste as haws are not like cranberries at all. Might be nice though.